IT is Scotland’s biggest tech company having this week been valued at $1bn but what is it like to work at the travel search engine’s Edinburgh headquarters? 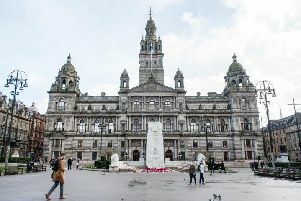 The company today pledged that it would always remain in Scotland’s capital despite having outposts in Singapore, Beijing, Shenzhen, Miami, Barcelona, Sofia and Budapest. The rapidly growing firm, which saw revenues rise 42 per cent last year bringing income to £93m, employs around 300 people in Edinburgh, 50 at its Glasgow office and over 250 around the globe. Skyscanner is the brainchild of software developer Gareth Williams, who designed his own software to search multiple airline websites for the best fares after becoming frustrated at visiting each one individually whenever he wanted to visit his brother in France. The first office opened in Edinburgh in 2004. The firm now has more than 600 staff across the globe. The above pictures show what the working environment for workers at the company’s Quartermile HQ which it has been based at since 2012. From the reception desk made out of an old airplane wing to the video conferencing room complete with airplane seats, Skyscanner’s office like the company itself like to think differently. There are no closed meeting rooms here but open booths called ‘huts’ which have been given exotic-sounding names such as Bora Bora. There is also a table tennis table which transforms into a pool table and a Yellow room where employees can go to knock ideas around. You can also do something in their offices that would get you your P45 elsewhere - write on the walls. In between floors are scrawlings from employees with the company even laying on markers.